A nurse in Moncton was fired after allegations that she induced labour without consent, Horizon Health Network confirmed Saturday. 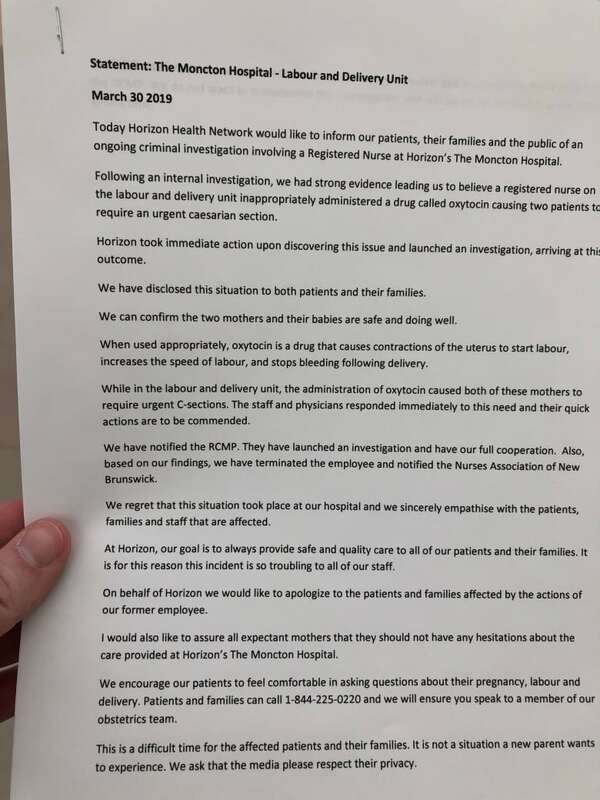 A press release from Horizon Health said it fired the labour and delivery nurse after an internal investigation revealed “strong evidence” the nurse administered Oxytocin, which caused two patients to require an urgent caesarean section. Horizon said it took immediate action to launch an investigation. Oxytocin is a drug that causes contractions and is used to induce labour, speed up labour and stop bleeding following labour. The health authority said the patients and their families have been contacted. “On behalf of Horizon we would like to apologize to the patients and families affected by the actions of our former employee,” the press release said. Horizon said it will not be commenting any further at this time. RCMP said they are investigating an incident at the request of Horizon Health. They say no arrest has been made.